Fostering spiritual growth, developing leaders and advocating for justice. For the past 140 years this has been the mission of United Methodist Women. What started as six members has grown to over 800,000 members worldwide, and with new structural changes coming to the United Methodist Women, leaders in Florida are looking forward to fulfilling that mission in new and exciting ways. The proposal would need to be ratified by the General Conference meeting in Tampa in 2012. The UMW and other women’s programs were brought under the oversight of the Women’s Division in an agreement put into place in 1964. Since that time the UMW and the GBGM have worked together to develop missions focusing on women, children and justice issues around the world. Now, according to the website, the two groups would be "structurally separate, missionally related." The reasons for the split have to do in part with representation. The 1964 agreement provided that the UMW would have one-third of the seats on the GBGM board, but recently – responding to the Call to Action report – the board decided to reduce its size and increase representation from the international, or Central, conferences. The UMW will now have just five of 30 seats on the board. Another complicating factor is that the United Methodist Women is an organization based in the United States, while the Women’s Division also deals with overseas conferences that have their own women’s organizations. "This is the best decision for United Methodist Women to continue its ministry with women, children and youth as a separate entity from Global Ministries," said Judith Pierre-Okerson. Pierre-Okerson is a member of the Women’s Division board of directors representing the Florida Conference. She sat on both the policy-making committee and the administrative committee for the proposed changes. "We carefully and prayerfully considered each possibility as we reviewed and studied the different reports coming from the Call to Action and the Global Nature of the Church study committee," she said. If the split takes place, the Women’s Division would become known as United Methodist Women, Inc.
"The way I see it, United Methodist Women will continue to be the strong organization of women growing in faith and devoted to mission of the United Methodist Church,” Pierre-Okerson said. Nelida Morales, president of the Florida Conference United Methodist Women, believes that UMW groups in local churches will most likely be unaffected by the parting of ways. "They probably won't even notice the changes," she said. "But, we know that local women are the ones who support the whole program ... so we will make sure that everything that is done at the top is for the goodness of the whole church and the whole United Methodist Women organization. " In fact, for many local UMWs, the changes will fit into what they have already been doing. 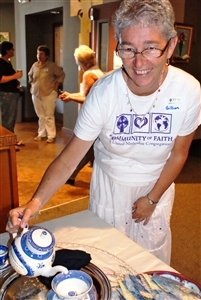 Community of Faith United Methodist Church in Davenport has had an active UMW for about three years and has developed its own programming without much input from the national level. "None of our executives have ever been a part of the UMW before," said Gillian Wolfe, UMW Vice-President for Community of Faith. "So we have already organized ourselves and planned our meetings as we saw fit and I don't expect that to change." Wolfe noted that during her dealings with UMW she only received communication from the Florida Conference, so she was looking forward to hearing more about the structural split and how that will affect her group and their pledge dollars. But according to the UMW website they should not see many changes in those areas either. And, Morales believes that even more information will be coming up in the next few months as the committee finalizes legislation for final approval at General Conference 2012. "Right now we have a press release on the way, so people will have access to that and we will promote that in district newsletters and conference newsletters," she said. Neither Morales nor Pierre-Okerson see any issue with the legislation passing with flying colors at General Conference. "I cannot foresee any disagreements, though of course there are details to be finalized," Pierre-Okerson said. "This is a mutual agreement between Women’s Division board of directors and Global Ministries' board of directors. Women’s Division directors voted unanimously for the separation plan. GBGM board of directors voted to affirm the plan and to bring complementary legislation forth to General Conference. ...This is a new time in the life of our church." More information regarding the separation can be found on the GBM-UMW website.